BOSTON - The highest scoring team in baseball put up its highest scoring inning of the season. 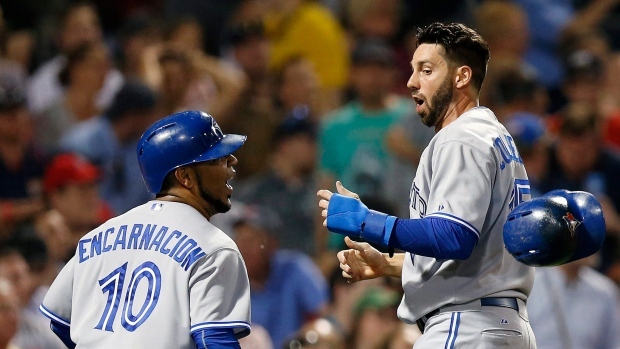 The Toronto Blue Jays scored nine runs in the seventh — all before making an out — and beat the Boston Red Sox 13-10 by overcoming an 8-1 deficit Friday night for their ninth straight win. "Incredible," Toronto manager John Gibbons said of the outburst. "Relentless" is how Russell Martin described the offence after his bases-loaded triple snapped an 8-8 tie. "Long" was Boston manager John Farrell's analysis of his team's worst inning in a year in which it is in last place in the AL East and a season-worst eight games under .500 (27-35). Justin Smoak drove in three runs, two scoring on his homer that made it 13-8 on the first pitch after Martin's triple. "It was awesome," Smoak said. "It can happen any time with this lineup." Trailing 13-9, the Red Sox had a chance to tie it in the eighth when they loaded the bases after Xander Bogaerts singled in a run. But with two outs, Mike Napoli took a called third strike. "My mindset was to go up there and do some damage," Napoli said. "It's a tough one to swallow." Brett Cecil gave up an RBI double in the ninth to Rusney Castillo but got his third save. Steve Delabar (2-0) pitched a perfect sixth. Junichi Tazawa (0-2) took the loss. Boston took a 5-0 lead in the first against Drew Hutchison when Pablo Sandoval, a two-run shot, and Mookie Betts hit back-to-back homers and David Ortiz had a two-run single. Smoak's RBI-triple made it 5-1 in the second before Dustin Pedroia's three-run homer put Boston on top 8-1 in the fifth. Toronto scored three runs in the fifth off Joe Kelly, who left after the sixth with an 8-4 lead. Then came the seventh when Toronto's first nine batters reached base — three against Matt Barnes, five against Tazawa and one against Tommy Layne — with all of them scoring. "We have a ton of power and when we have that there's always a chance to come back," Gibbons said. "I don't put anything past these guys." Toronto entered the night with 325 runs, 50 more than the New York Yankees, who had the second-most in the majors. Kevin Pillar led off the seventh with a single and scored on a double by Ryan Goins. Jose Reyes then singled in a run, Josh Donaldson singled and Jose Bautista followed with another RBI single. Edwin Encarnacion then singled, loading the bases, and Toronto tied it at 8 on an error by third baseman Sandoval, who dived to catch Chris Colabello's hard shot down the line then dropped the ball. Martin cleared the bases with his triple over the head of centre fielder Castillo, chasing Tazawa. But Smoak drove the first pitch from Layne into the seats in left for his fifth homer and a 13-8 lead. Layne then settled down, retiring the next three batters. Red Sox relievers retired the last nine Blue Jays. Toronto's last nine-run inning also came at Fenway Park. It happened in the sixth inning last July 28 in a 14-1 win. Only three players in that lineup — Reyes, Bautista and Goins — played Friday night. Boston LHP Wade Miley said before the game "I handled it terribly" when he yelled at Farrell in the dugout Thursday night after being taken out after four innings of a 6-5 loss at Baltimore. Farrell said Miley's behaviour was "unacceptable." Red Sox: LF Hanley Ramirez missed the game with soreness in his left knee and left hamstring. ... CF Betts left the game in the top of the third with a low back sprain when he ran into the low fence trying to catch a triple by Smoak. Blue Jays: RHP R.A. Dickey (2-6, 5.35) goes for his third straight solid outing in the second game of the three-game series. He allowed a total of four runs in his past two starts after giving up 22 in his previous four. Red Sox: RHP Clay Buchholz (3-6, 4.07) tries to bounce back from his third-shortest stint of the season. He allowed four runs and 10 hits in 4 2-3 innings Sunday in a 7-4 win against Oakland. In his previous start, he allowed three hits in eight innings in a 1-0 victory over Minnesota. This includes that Toronto has won nine straight games.